Whoohoo! February is BIRTHDAY month at our house! Granted, all of the birthdays fall on the same day, but we find everyday in February worth celebrating! We spent the majority of February 2011 in the hospital fighting to remain pregnant. At the end, we were rewarded with four of the most precious babies ever. It's so easy to forget how big God is sometimes. Looking at the big picture is a wonderful reminder of His provision. We are so grateful to Him for protecting our babies through our pregnancy and sending them home with us! Kicking us off, is Caleb Sean. Our sweet, shy, first born son. How old are you? "I'll be TWO in three weeks!" What makes you happy? "Being held by Mommy or Daddy. I don't like strangers very much. They scare me." What is your favorite animal? "I love my doggy lovey, and my stuffed turtle. I like to carry my doggy around with me." What is your favorite color? "Blue." What is your favorite thing to eat? "I love vegetables, fruit, beef, poultry, fish, crackers, muffins...just about everything. A better question is, 'How fast can I eat?' "
What is your least favorite thing to eat? "I don't like peanut butter very much. I'll eat it, but I prefer not to." What is your favorite thing to do? "I love being held. After that, I love being held upside down and being tickled!" What is your favorite TV show? "I really like my VeggieTales." What is your favorite movie? "Baby Einstein videos are a nice way to break up the VeggieTales shows." What are you really good at? "I'm really good at 'Stranger Danger.' I also really like to play with my brother Elijah." What is your favorite song? "Hmm...good question." What do you and your mom do together? "Lots of snuggling!" What do you and your dad do together? "Smile and do the head wagging game." What is your favorite book? "All of them. I love reading!" Are there any other questions we should add to our interviews? We are hoping to do this every year to track how they grow and change! 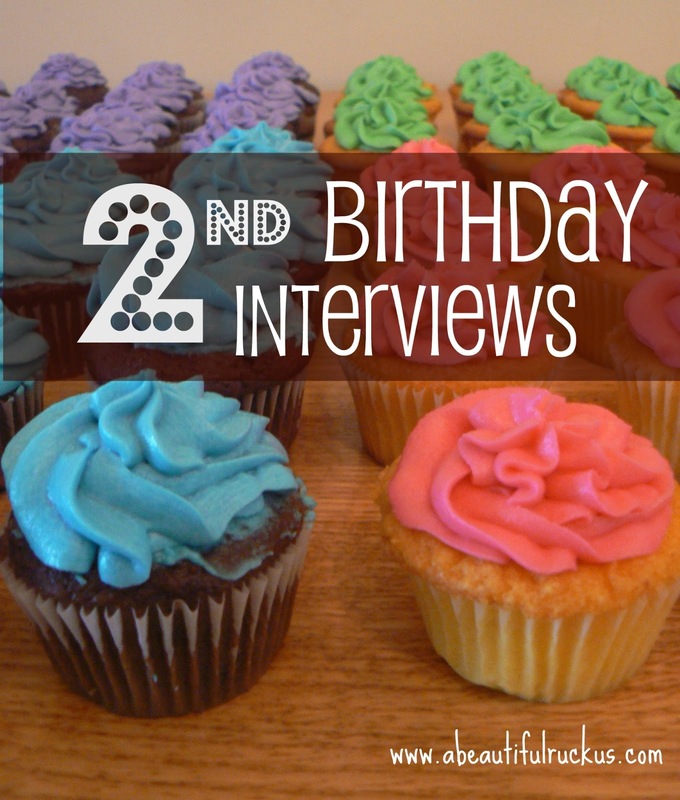 Thanks to Sarah at OMG There's Three for the birthday interview inspiration! 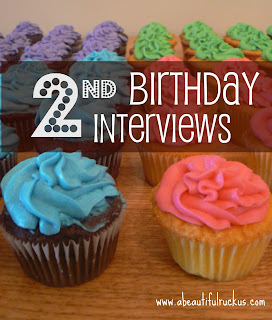 from 3 and up i've interviewed my boys, i also do a top ten things i will miss about that age. i try to keep a journal of what i want to remember. that has been lots of fun to look back and reminisce and laugh at!! The top ten things sounds like a cute idea! Wow, I'm impressed with the food he likes. Must be making up for the girls.